Water based sprinkler systems are the simplest, least expensive, and most commonly used life-safety fire suppression methods protecting medium to large facilities. While effective, the inherent properties within those systems create a corrosion friendly environment resulting in potential failure either in the form of pinhole leaks or obstructions preventing the system from operating properly in the event of a fire. As such, thorough evaluation of fire sprinkler systems is paramount, which is why these are the most common systems evaluated by SoniTech using its advanced Ultrasonic Localized Guided Wave (ULGW) inspection method. Not only is ULGW accepted by the NFPA to satisfy the 5-year Internal Piping Condition and Obstruction Investigation requirements outlined in chapter 14 of NFPA 25, many commercial property insurance carriers accept ULGW to evaluate sprinkler piping under guidelines established for their policyholders. SoniTech’s unbiased reporting can be used not only as a preventative maintenance tool, such as in the case of the NFPA 5-year investigation, but also as a diagnostic tool to determine the cause and extent of existing corrosive activity either when problems arise or as a precursor to the installation of nitrogen in an existing system. Oxygen Corrosion and Microbiologically Influenced Corrosion (also referred to as MIC). Oxygen corrosion, the more common of the two, is also the easiest and least expensive to mitigate. Oxygen corrosion occurs when there is an air/water interface within the system caused by trapped air, either from inadequate venting or dissolved oxygen in the water. The effects of oxygen corrosion are generally limited to areas where the air/water interface exist, but shifting of the interface(s) can occur from draining and refilling the system, significantly expanding the affected area. With early detection, mitigation is as simple as removing the oxygen, but it is important to know where those pockets reside. Historically it has been difficult if not impossible to map the exact locations of trapped air, but that has changed with the advent of ULGW. SoniTech can easily and accurately pinpoint those locations, all while the system remains operational. MIC, although less prevalent than oxygen corrosion, is typically a more costly issue to resolve. If not addressed early, MIC related corrosion can quickly spread like a cancer to compromise large areas within the system. It can damage valves and sensors, and will overtake new sections of pipe installed as a stopgap repair for pinhole leaks. It is important to note that the mere presence of MIC in system water does not necessarily mean the bacteria has had a notable impact on pipe integrity, nor will it indicate the location or degree of corrosion build-up and pitting, although odor and discoloration of water discharged from the system (as observed from periodic flow tests, etc.) can be an indicator of larger issues. 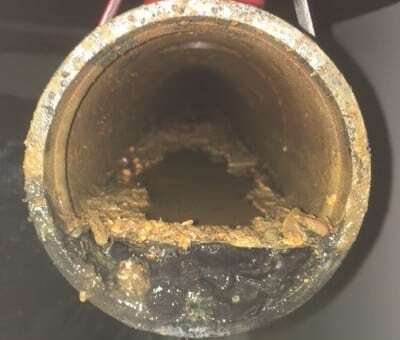 Simply replacing compromised pipe is a recipe for disaster, leaving nodules, sludge, and pitted piping behind that can compromise system functionality. Knowing the location and severity of MIC related corrosion will allow for the most effective and efficient mitigation practices specific for your systems’ issues. A common misconception is that dry and pre-action systems are less susceptible to corrosion due to the lack of water present, especially with the widespread use of galvanized piping…which many still consider to be the industry standard. That is a misnomer creating a false sense of system reliability, and lack of evaluation can be a recipe for disaster. 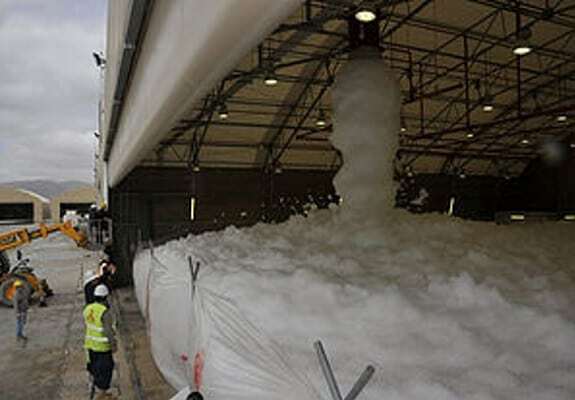 Although dry and pre-actions systems are not used as widely as wet sprinkler systems, a significant number of facilities still employ these systems and the areas they protect tend to house expensive water sensitive equipment and processes, so repairs and failures are more costly. 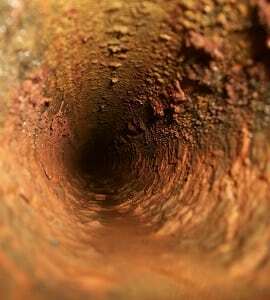 As with wet systems, oxygen corrosion is the most common culprit behind dry pipe failure. Most dry and pre-action fire sprinkler systems have trapped water in them, either left behind from the mandated commissioning process, accidental tripping of system valves, or residual water formed from condensed water vapor pumped in through the system/service air compressor. Ridges at fittings, poor pitching, lack of low point drains, and “dams” created from corrosion buildup prevent all of the water from being drained out, so pools of water sit inside the piping creating pits, sludge, and nodules that impact system functionality. 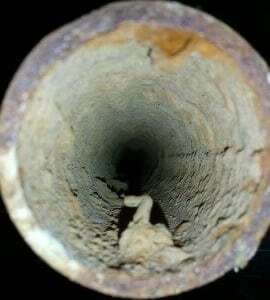 Severe corrosion can result in pinhole leaks that allow water to drip or spray on sensitive items, and if left long enough, can compromise the pipe enough to cause a rupture during system activation in the event of a fire or unintended tripping of the system valve. This is the easiest and least expensive form of corrosion to mitigate if caught early. Proper pitch, addition of low point drains, or even opening existing drains are sufficient to remove most water present, and appropriate usage of nitrogen can remove all trace remnants of water and water vapor left in the system. MIC, although not particularly common in dry or pre-action systems, can still be present and result in costly, catastrophic, and potentially deadly damage. 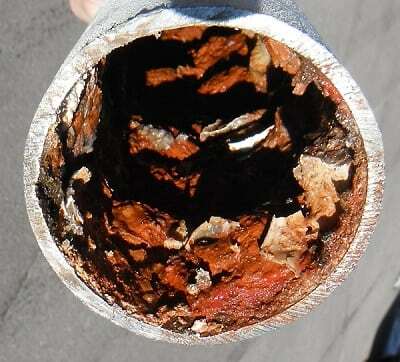 Due to the lack of water in dry/pre-action systems, it is less common to see MIC related corrosion in dry system piping, but the bacteria can be introduced during fire code related testing procedures or from accidental tripping of the system valve. If water containing MIC, particularly aerobic MIC, is left in these systems, corrosion development can be rather significant and rapid. The nodules from MIC can create obstructions that restrict water flow and pitting beneath those nodules can develop into a leaking pinhole, damaging the very sensitive property and processes the system was designed to protect. Automatic fire suppression systems using chemicals in addition to, or in lieu of, water (such as FM 200©, 3M© Novec©, AFFF, etc.) are more rare than 100% water based systems but they also frequently protect the highest risk areas. While the anti-corrosive nature of these chemicals would normally preclude corrosion development within system piping and the need for internal integrity evaluation, the highly mission critical nature of the equipment and processes they protect justifies assessment. Poor handling of piping prior to installation and external factors such as humid or corrosive environments (seawater vapor, corrosive chemicals in the air, etc.) 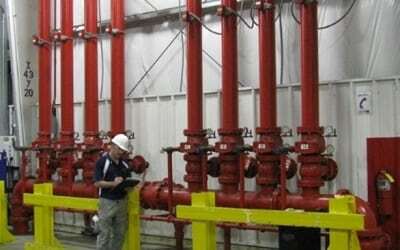 could impact system piping integrity, warranting nondestructive evaluation. Furthermore, the same corrosive activity can develop within wet sprinkler piping can be present in water supply piping that is needed for water/chemical based systems like AFFF. For more information on how to acquire unbiased data to make well informed fact based decisions.